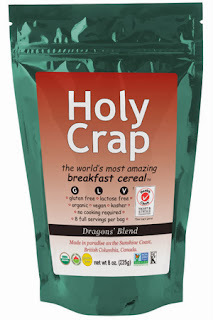 Holy Crap cereal was founded by Corin and Brian Mullins in 2009. Originally named Hapi Food, Corin Mullins was on a mission to make something safe for her husband's food allergies. One of their first customers said "Holy Crap...this is amazing." Brian Mullins changed the brand name and suddenly sales went from ten to one thousands bags a day. That's a 1000% increase! Holy Crap gained popularity after appearing at a kiosk during the 2010 Vancover Olympics. Popularity grew from the Olympics. After appearing on Canada's Dragon's Den (equivalent to Shark tank in the US) in 2010, Holy Crap generated over one million dollars in revenue the following week. Since then, Holy Crap is appearing in more than 2,200 stores across Canada and spreading throughout the United States. Holy Crap ships to over forty countries online through the online store. 65% of Holy Crap's ingredients are Canadian. Holy Crap has even made its appearance in space through the International Space Station. Canadian astronaut Chris Hadfield completed a five month space mission in April 2013. Holy Crap Cereal is truly out of this world! 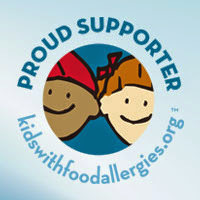 All cereals are non-GMO, vegan, gluten free, raw, kosher, and free from the major allergens. One serving has more Omega 3s and 6s than salmon, more protein than flax seeds, and more fiber than bran muffins. Holy Crap has four different varieties to choose from. 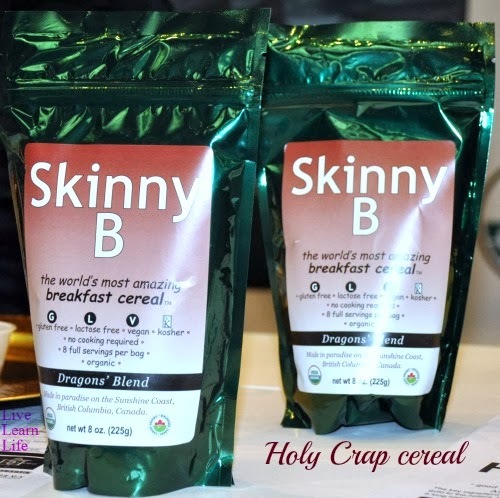 The main difference between Skinny B and Holy Crap is that Skinny B only has chia, hemp hearts, and buckwheat (contains no wheat). Holy Crap also contains dried cranberries, raisins, apple bits, and cinnamon). 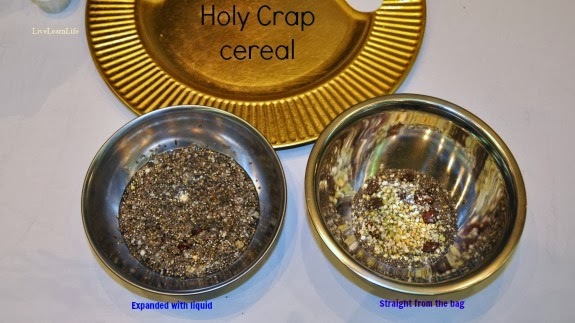 Each serving of Holy Crap cereal is 2T and 1/4 cup of liquid. Allow to sit for at least three minutes. Each bag contains 8 servings. I tried the Holy Crap cereal as well as the Skinny B cereal with water as well as with rice milk. Both had good flavor. To have a grab and go version, make it the night before and stick it in the fridge to grab and go. 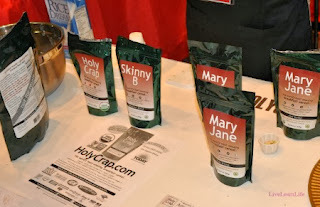 Holy Crap officially sponsors the bloggers of the GFAF expo for 2013. I was chosen as an official blogger this year. Thank you so much for allowing this great product to be shown off and for sponsoring this year! This stuff looks good, and the name makes me laugh!